The pie chart below shows the percentages of millionaires in the USA, by main profession. Read the following model answer. There are eight mistakes in the use of articles. Find and correct the mistakes. 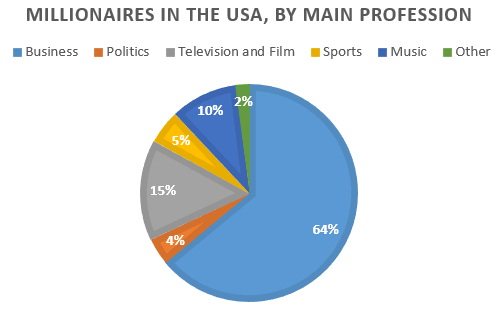 The pie chart shows the main careers of millionaires in the United States in percentages. We can see that a majority of millionaires are businesspeople, while other jobs such as in the entertainment or the politics only represent small proportion of the total. However, it could be said that millionaires are mostly people in the business and entertainment industries. In the USA, people who work in a business account for just under two thirds of millionaires. Next largest group of millionaires on the chart is people who work in film and television. They account for 15% of the total. This group is closely followed by people who work in music. This sector accounts for the tenth of all millionaires in the USA. The smaller groups all make up fewer than ten per cent of millionaires when combined. These people are sportspeople, politicians and people in other careers. The smallest group is an ‘other’ group with two per cent.